A combination of Japanese engineering and American creativity, brought about the Baby Lock brand. If you truly want a baby lock sewing machine, then you believed in the motto of Baby Lock: “for the love of sewing”. Become a sewlebrity with any of these critically appraised 5 Best Baby Lock sewing machines that would make you enjoy sewing and quilting. A perfect way to combine your love for sewing and exceptional creativity into one without any sacrifice. This sewing and embroidery sewing machine, possess several innovative and up to date features, making sewing extremely easy for any professional and hobbyist. Can you imagine the magic you can perform with the 537 built-in stitches or the 266 on board embroidery stitches? You’ll achieve a whole lot than an ordinary sewing machine could deliver. You just need to follow the threading and bobbin winding guides of the Baby Lock Unity – you’ll find it straight forward. 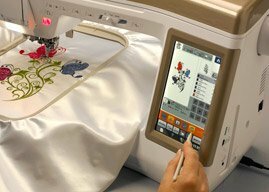 When the sewing machine is put on, the touchscreen LCD will provide three options; sewing, embroidery, and embroidery editing. Just choose whichever you intend to work on, and baby lock unity sewing machine will respond with all seriousness. For me the only drawback of this unity lock sewing machine is the absence of an onboard stitch selection guide that will help you avoid confusion. 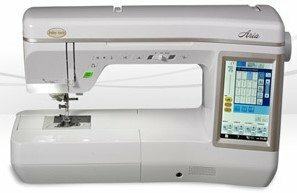 However, the digital dual feed system with an attached embroidery unit are great qualities of this sewing machine. PBS’ Quilt in a Day has indeed made Baby Lock Aria a very popular sewing machine. 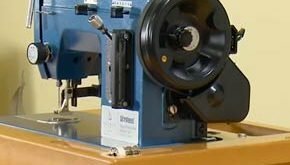 A machine that every successful quilter must use. Baby Lock Aria will give you all the space to have a problem-free sewing and plan without any hassles. One of the most user-friendly Baby Lock sewing machine. Any of the 537 built-in Stitches is strong enough to sew through even upholstery with an automatic threading system. You can even create your stitch pattern, save and delete from the memory of the sewing machine. The workspace is spacious enough for most of the projects you’ll love to work on. With a storage compartment that can safely keep every of your sewing accessories. This sewing machine generates little or no vibration, and the stitch quality is excellent. Even though this machine is user-friendly, it is not advisable for first timers and entry level users. Most appropriate for experienced hands in need of a versatile quilting and sewing machine. Just like Baby Lock Unity Sewing machine, the easy to follow guides and instructions will allow a beginner to understand every aspect of the Aventura. As easy as this sewing machine may appear, beginners may need more time or supervision while using the Aventura. This is a well-built sewing machine that possesses the finishing of high-end sewing machine. What can you achieve with 300 built-in stitches, 141 built-in embroidery designs, 5 built-in alphanumeric fonts, 90 Baby Lock designs, 13 font styles and a 7mm adjustable stitch length? A whole lot, right? The solid build and the humming but quiet motor will make you want to always use a Baby Lock. You will find the stitch length and width adjustment a bit difficult and cumbersome no matter your experience level. Nonetheless, this is a nice intermediate to beginner’s friendly sewing machine at an affordable price tag. 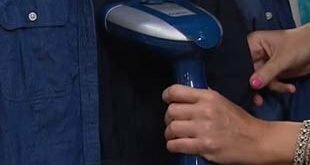 If you refer to this as a sewing machine, you are not wrong. You may decide to call it a quilting machine, you are still right. Thinking of it as an embroidery machine is still very correct. 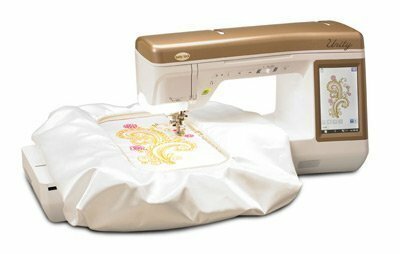 Not every sewing machine can do everything, but Baby Lock Ellismo Gold 2 can do a whole lot. 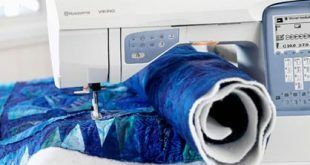 You may get confused if you just want to make minor mending, an elaborate sewing, creating attractive designs through embroidery or top of the line quilting works. Why? Baby Lock decided to put in too much in just one machine. Just see working on the Ellismo Gold 2 as a privilege and a pleasure. You don’t come across a machine with 683 built-in stitches, 617 embroidery designs, and 57 needle positions every day. You have a Trueview LCD screen to assist in editing designs, a bright LED light to illuminate your workspace at odd hours, and USB connectivity to utilize to your advantage. Pinpointing a fault is more like a wild goose chase when it comes to Baby Lock Ellismo Gold 2. A whole 3 USB ports on just a single machine with a numerous built-in stitches and designs is enough to convince you of what this pretty can do. No sewer can walk past the Sofia 2 without wanting to take it home and test drive this beauty. You will either be glued by it’s on board stitches, the look the bright colored LCD screen that gives you total control. Belonging to Baby Lock A series line up but standing out due to its awesomeness and features. There are just too much features equipped on Baby Lock Sofia 2 but some deserve special mention. The animated LCD screen is number one as far as LCD screens on sewing machines is concerned. The inviting build of Sofia 2 is a result of the easy to follow guides, the three-level speed control and a host of other features. You won’t need trial and error to arrive at a perfect seam; there is a seam guide clearly marked out in both inches and centimeter. Adjusting the stitch length and width is also made easy. Get ready for the best time of your embroidery work as you can use design from either a flash, computer or an embroidery card. One limitation that can be spotted on this versatile beast is the inability to carry out large embroidery works. Outside that intermediate users will appreciate the guides and the brightly lit LCD screen which makes sewing and embroidery an enjoyable. You are making the best decisions of your sewing career with any of the above baby lock sewing machines. The ability of any of the above to perform dual or triple functions is an advantage. Baby Lock Aria is a what every professional quilter should have in the workshop. Equipped with a spacious workspace that is enough for large quilting projects. Top professionals who are concerned about embroidery will enjoy Baby Lock Ellismo Gold 2. Even at their level, the magnitude of features is enough also for sewing. Which one will you use to become a sewlebrity? Let us know.